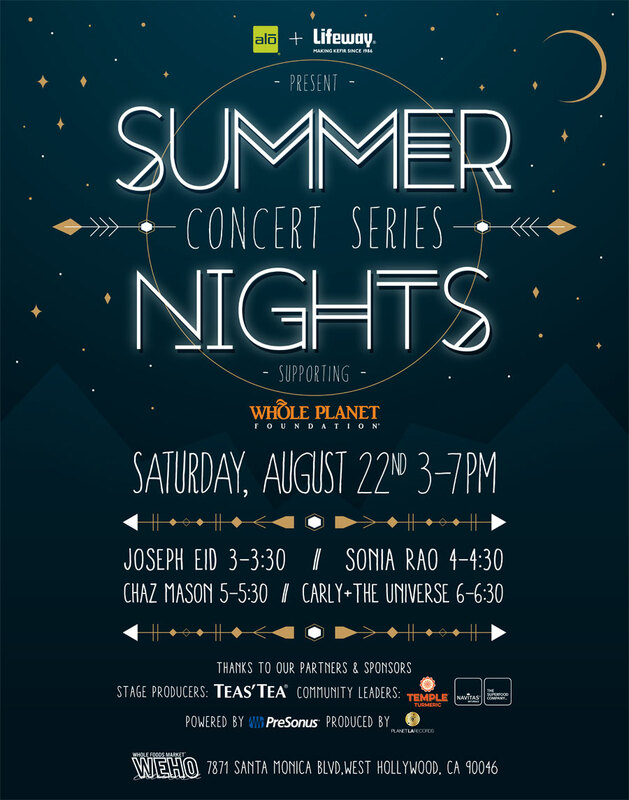 The Summer Music Series supporting Whole Planet Foundation presented by ALO and Lifeway continues at Whole Foods Market West Hollywood on Saturday, August 22, 2015, 3-7pm. Featuring Joseph Eid (3pm), Sonia Rao (4pm), Chaz Mason (5pm) and Carly and the Universe (6pm). Free show and samples from our partners at ALO, Lifeway, Teas’ Tea, Temple Turmeric, Hubert’s, Chameleon Cold Brew, Jackson’s Honest Chips, Ka-Viti Water and more.